Science uses Latin names to describe animals because titles given to animals varies greatly from region to region including hogs of the world. Take for example Pomoxis nigromaculatus which most fishermen know as “crappie”. In Louisiana the most common name is “sac-a-lait” and in other areas anglers call it “white perch”. They are all the same fish but people tend to name things regionally. For all practical purposes the hogs we hunt are Sus scrofa but there are a number of regional variations that some people are adamant are a different species entirely. Take the “pineywood rooter”, which is simply the genetic variation of feral hog most common in East Texas. The snouts are typically long, thin snouts and they are typically black in color. These as with all hogs in the United States are not native to this country but there are many hunters who say the rooter is the “original wild hog” and they are native to the region. They might have been here for hundreds of years but they are not native as whitetails and even black bears are. They are imports. “Russian boars” are the original sus scrofa and thus the genetic roadmap for all hogs. There are very few true “Russians” in the United States with the only pedigreed specimens living on small high-fenced ranches. There are however a good number of hogs particularly in areas of Central and south-Central Texas that have a lot of characteristics of Russians with some looking almost as if they were captured in the Black Forest of Germany. The appearance of hogs in different regions has much to do with the kinds of domestic hogs allowed to roam freely in the region years ago and also the sources still entering the woods. Near Deweyville about 15 years ago, people were dumping off potbelly pigs along one particular road for a year. For a number of years people thought they were excellent pets but when they realized the animals got much bigger than expected they would release them into the woods. Well, this particular road which led to a county dump became the place to release potbellies. I had to take this road to one of the hunting clubs I was on and would frequently see a new batch of potbellies. Well, it did not take long for these animals to breed with the ferals there and create some interesting looking pigs with a fat face and the classic pot belly. 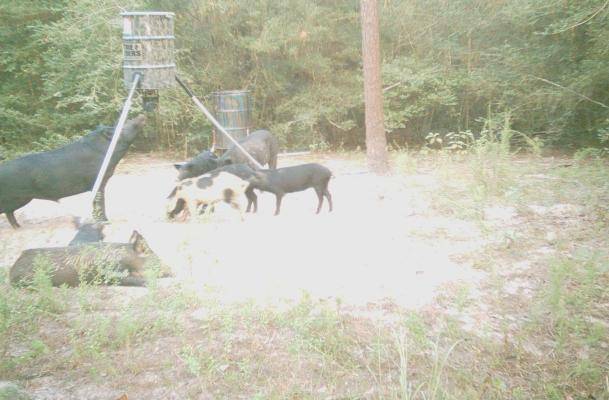 I will never forget seeing a 200-pound sow that walked in front of my game camera have the snout of a “pineywoods rooter” and the belly and coloration of a potbelly. Some hunters particularly in East Texas report killing “mule-footed hogs” which have one big hoof instead of being split like a typical pig. These animals have reached legendary status in the hog hunting community and are considered trophies. What they are killing are feral descendants of a super rare domestic breed. According to researchers with Oklahoma State University, “The most distinctive feature of the American Mulefoot hog is the solid hoof which resembles that of a mule. Pigs with solid hooves (also called syndactylism) have attracted the interest of many writers over the centuries, including Aristotle and Darwin. The Hereford is a medium size hog breed that is unique to the United States. It was developed in Iowa and Nebraska during the 1920s from Duroc, Chester White, and Poland China bloodlines. Additional breeding and selection led to the identification of 100 animals as foundation stock in 1934, and the National Hereford Hog Record was formed the same year to promote the new breed. Within the first decade of its history, the association attracted 450 members. Most of the interest in the Hereford breed was found in Illinois, Iowa, and Indiana. Another variation that occasionally comes up in conversation is what some hunters call “warty hogs”. According to the American Livestock Breeds Conservancy (ALBC) these are likely descendants of the domestic “Red Wattle Hog”. “The Red Wattle is a large, red hog with a fleshy wattle attached to each side of the neck. The wattles have no known function. They are a single gene characteristic and usually pass to crossbred offspring. The Red Wattle comes in a variety of shades of red, some with black specks or patches, and red and black hair. Some individuals are nearly black. The head and jowl are clean and lean, the nose is slim, and ears are upright with drooping tips. The body is short coupled and the back slightly arched. Mature animals weigh 600-800 pounds, but may weigh as much as 1200 pounds and measure up to four feet high and eight feet long. “Interestingly, they said it was derived from the large, red, wattled hogs found in a wooded area of eastern Texas in the early 1970s by Mr. H.C. Wengler. Despite all of these potential variations the animals are legally known as “feral hogs” and therefore are considered varmints under law which means hunters in Texas can take them any time of year with no bag limit and by virtually any means whether are red and wattle or black with a low-swinging pot belly.